A year and a half ago I wrote all about my decision to move from New York City to Denver. The response to that post has been incredible! So many of you have contacted me, eager to learn more about how I’ve found life in the Mile High City after living here for some time. Many of you are contemplating a move of your own, others are curious to know if my experience has been the same as their own. Now that I’m three years into living in Denver, I’m going to give you the lowdown on all the feels about relocating to Colorado – all from my perspective as a former New Yorker. Is the quality of life better in Denver vs. NYC? I think so! I feel like my quality of life has drastically improved moving from NYC > DEN. Mainly the housing is more affordable and accessible compared to what it’s like in NYC. The rental market is very plentiful in Denver, there are so many new buildings it’s pretty easy to find one to live in. If you are a working professional and/or have the means, you can simply walk into the leasing office of an apartment building and find an apartment. However, this means on the affordable housing front, there are challenges in Denver. If you are looking to buy, the housing market has heated up over the last decade, and to many people it is seen as being expensive, although some signs point to it slowing down a bit. People who aren’t from NY or SF will tell you it’s expensive (and they are right, housing prices have skyrocketed over the years), but coming from NYC and our distorted view of how much housing costs, in our eyes you get a lot more for your money. How different is the lifestyle in Denver compared to New York? I think NYC and Denver are very different places. I generally don’t even try to make comparisons, that’s how different I think they are. If you are looking for a place that is more laid back than NYC/Brooklyn, then Denver definitely fits the bill. The one thing I have noticed recently is whereas in places like NYC and San Francisco there is a major class and status undercurrent, in Denver I feel like that isn’t there. People really don’t seem to care where you live or how much “stuff” you have here. It’s much more down-to-earth, which I like. People here love the outdoors here. People are very outdoorsy here and it’s easy to find hiking, rock climbing, cycling, clubs and groups you can join and meet people with similar interests. There’s still a spirit of the West that runs through Denver, so people are also pretty independent – I don’t really feel like people move around in predetermined herds. It’s kinda a do your own thing, drop in and out of groups kind of place. You might also discover your outdoorsy side as a result of living here, just like I did! How easy is it to make friends in Denver? In general, I think it’s a lot easier to be a newbie in Denver than in a city like NYC. Since it’s a city of transplants, people are very welcoming. Also what I find is that most people move to Denver because they WANT to be here, not because they HAVE to be here and with that brings a freedom to do things not out of obligation, but because you like them and want to do them. NYC can be a very rewarding place to live (and I think everyone who is able to should live there at least once in their life), but it definitely takes a certain level of energy, commitment, and tolerance for pain (seriously). However, NYC can be downright depressing if you don’t want to be there. In terms of what it was like to move, it was difficult to move someplace where I didn’t have a large network of friends or family, but I was lucky because I was moving as one part of a married couple (you always have a buddy to hang out with) and we had one relative living in the Denver area already – so that was a start. However, what I think you will find about Denver is that people are very friendly. Lots of people from all over the US (I don’t meet a lot of internationals) move to Denver from places like New York, Texas, California, the Midwest, and since many people don’t have established roots, they are very friendly and welcoming. I recently met a woman who moved here from Florida just a few months ago and she was marveling about how many new friends she had and how much she loved living here. Do you get homesick? Is it hard being away from your family and friends back home? Short answer: No, I don’t really get that homesick. As I stated before, Denver is very different than New York, so it’s not like I’m constantly comparing the two. However, I do end up going back to NYC several times a year so I get to see family quite frequently, so I’m able to get my NYC fix every few months and check in with my friends and relatives. If I didn’t have that, I probably might be slightly homesick, but not enough to want to move back at this point in my life. What’s the weather like? No, seriously, is it cold all the time? Without fail, all year long my co-workers back in New York are constantly asking me if it’s cold in Denver. Let’s get this straight: DENVER IS NOT ANTARCTICA. Denver has temperate weather all year long. It does get colder in the winter – we can have days that are below freezing, but because it’s a semi-arid climate, the humidity is lower so you don’t get that type of cold where the wind just cuts right through you and chills your bones. We do get snow, but again, because it’s semi-arid, the snow evaporates quickly (no piles of dirt snow hanging around for weeks), and there will be days where it will snow and then the next day is 75 degrees and sunny – even in February! I’m always running into people who moved here from New York. At times I thought maybe I should start a club for former New Yorkers who now live in Denver. You will find many people who have moved from all over the country coming to Denver. It’s a very vibrant city with lots of younger people and tons of creative energy. What’s the dating scene like in Denver compared to NYC? I’m married, so I’m not really the best person to answer this question. Yes, Denver is known as “MENver” but in reality the population is almost evenly split between men and women. Some of my single friends complain about the “quality” of the men (too “bro”-ish, flakey) but honestly, isn’t that EVERYWHERE???? It is most definitely not worse than what you’re dealing with in NYC. I’m a New Yorker so I don’t really do the driving thing. Do I need to drive to live in Denver? Driving is kinda a thing here – most people drive, but increasingly I’m meeting people who don’t own cars. When we moved from NYC we didn’t have a car, and we have decided not to get one. We crunched the numbers and found that it would probably be cheaper NOT to own a car because we wouldn’t need to pay all the “hidden” costs of owning one (no paying to lease a vehicle, no insurance, no parking to pay for, etc.). How do I get around? Just like any major city, we’ve got ridesharing like Lyft and Uber. We also have public transportation that works really well if the train line or bus route goes to where you are going, but there are definitely limitations. Riding bikes is a great way to get around when it’s not too cold. If you end up getting a job downtown, it will be pretty easy for you to get around and do all your normal things without a car. When we want to get out to the mountains, we’ll rent a Car2Go or Zipcar. If we need to go further than the companies allow in terms of mileage, a traditional car rental place is another option. I don’t think I can get away with not owning a car. Is traffic bad? Since I don’t regularly drive, I can’t tell you from first-hand experience, however if you are trying to go anywhere during rush hour, it can be painful. Denver was recently ranked as the 18th most congested city in the US, but cities like LA, Boston, NYC, and San Francisco were worse. Also if there is a Rockies or Broncos game, traffic can be pretty bad coming into downtown as well. Many people try to avoid traffic by staggering their work hours (coming in early, leaving earlier), or take public transit that can bypass traffic, like the light rail. What’s the political climate in Denver? Is it liberal or conservative? Colorado is a purple state. Unsurprisingly, the heavily urban areas are pretty blue, where the more rural areas are red (with the exception of Colorado Springs, Castle Rock, and Greeley, which lean conservative). Denver is considered a reliably blue area, as is Boulder, but that doesn’t mean everyone is left-leaning. Colorado’s registered voting blocs are closely split between Republicans, Democrats, and Independents, but Independent voters are the largest bloc. As a result, I think many Coloradans like to think of themselves as independent thinkers. One of the things I have really liked about voting since moving to Denver is that I feel like my vote really “counts” because votes are not guaranteed to sway in the favor of one particular party. How easy is to access to the outdoors from Denver? I would say it’s pretty easy to access nature from the city, especially if you have a car. You can find great hiking in nearby Golden or Boulder. When I was training for my NOLS course, we’d drive just 30 minutes to Evergreen and go hiking for a couple hours after work. There are countless county, city, and state parks to explore and hike/mountain bike for free. It’s definitely a little more challenging to go hiking without a car. However, my husband and I recently experimented taking the FF1 bus to Boulder and getting off within walking distance of some trails in the Green Mountain Memorial Park area, which seemed like a good car-less option for an easy day hike. If you are in to cycling, there are many great cycling trails to take from Denver to other places (which people take advantage of year round). And if you like skiing, but don’t want to drive, Amtrak has a ski train that goes directly from Union Station to Winter Park. This all sounds great, but I’m still afraid? Any tips on how to figure out if Denver is right for me? Let’s face it, no amount of imagining or predicting can truly answer that question. Moving to a new city really is one of those things that you won’t know for sure until you’ve tried it. Something we did before moving here was to spend a week in Colorado, test running what it would be like to live here. We stayed a few days in Denver, but then headed out to the mountains and other areas of the state to see how we might spend our weekends. I don’t think I came away convinced either way after our trip, but it definitely made me feel more comfortable with the idea of moving now after I got a little taste of what my life could be like. I would definitely recommend doing something like this so you at least have something “real” to project all your “what if” questions onto. Also, my husband promised me that if we moved and we didn’t like it, we could always move back. Somehow someone else verbalizing that it was OK to move back “home” if it didn’t work out put my mind at ease. Ultimately, as I mentioned in my original post, I decided that NOT moving because I was afraid would be a bigger regret than having tried. After all, say you move and you don’t like it – at least you’ve learned a bit more about yourself in the process. Has this post help answer your questions about living in Denver? Please leave your story in the comments! 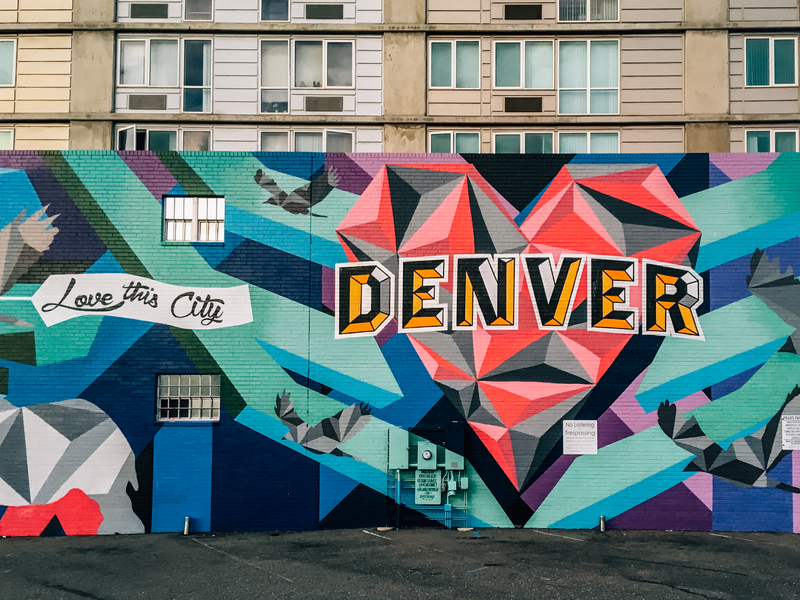 Also, if you’ve just recently moved to Denver (or are looking to visit), check out my city guide to a perfect weekend in Denver. It lists some of my favorite places to visit and eat!